McCain campaign misleads public on Obama’s tax plan. Senator Barack Obama is proposing tax cuts that would help struggling, middle-class families get back on track and provide relief during these financially uncertain times. No matter how many times John McCain claims otherwise, the overwhelming majority of Americans will never see a tax increase under Senator Obama’s plans. Obama’s proposals will lower tax rates for 95% of families, including the small business owners that are the core of our economic well-being. It’s time to help the folks that have been hurt the most by the Bush economic policies that McCain has backed for the past eight years. 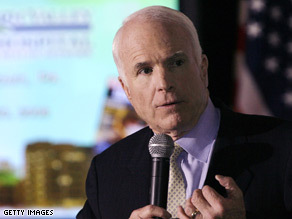 John McCain pledged to run and honorable, honest campaign. Instead he’s been using his stump speeches and attack ads to purposefully mislead voters about Obama’s real tax plans. That old school style of politics may have seemed acceptable, just “business as usual,” in the past – but there’s no place for it in the United States in 2008. This year we need real, thoughtful solutions, and honest answers from those who seek to lead us out of the economic mess we’re in. The crisis that we’re facing calls for innovative changes. We can’t get out of this mess using the same thinking and tactics that got us into it. John McCain’s plan calls for renewing Bush’s tax cuts for the wealthiest Americans. That didn’t create jobs. That didn’t stimulate economic growth. In fact, that approach is fundamentally more of the same, and the United State of America just can’t afford it. Before you vote, know who will raise your taxes more. According to independent, non-partisan comparisons, if you earn less than $250,000 per year? It’s McCain. John McCain wants to preserve and protect the tax cuts for the wealthy at the expense of the middle class, what we used to call “trickle down economics.” So far, all that’s trickled down is pain, high gas prices, unemployment, and foreclosures. Sound bites won’t fix our economy. It’s no wonder he and his running mate don’t want us looking back: if we learn from history they’re doomed. Will Obama really tax water? What about Capital Gains? Home sales? No, of course Senator Obama isn’t propsing a tax on water, but that’s among the fantastic smears being emailed around lately in what appears now to be a desperate attempt to mislead middle America. Are we really that gullible? Do people sit around the cooler at work kicking this one around? Meanwhile, the commercial media “news” sources (when they bother to report on the rumors) tend to focus on the rumor itself rather than either asking “who benefits” from the confusion, or trying to debunk the untruths. By serving to echo the lie(s) they instill doubts in the less savvy voters. Is that responsible journalism? What follows is a brief discussion of some of the particulars people seem to be asking about often – with interest that may well stem from the debunked but still-circulating emails. In case you want it spelled out, Obama has never proposed or even hinted at a tax on water or any other natural resource. The claim that “Under Obama your taxes will more than double!” circulating in some emails is simply false. The comparative rate tables that e-mail provides for McCain and Obama were fabricated for another false e-mail during the primaries and copied. It is supposedly a comparison of tax rates before and after the Bush tax cuts, but it grossly overstates the effect of the Bush cuts. Furthermore, Obama proposes to retain the Bush cuts for every single income level shown in this bogus table. Contrary to the claim in this e-mail, raising tax rates on capital gains or dividends would not result in higher taxes on any investments held in Individual Retirement Accounts or in popular, tax-deferred “college funds” under section 529 of the Internal Revenue Code. The whole point of such tax-deferred plans is that dividends and capital gains are allowed to accumulate and compound tax-free, and neither Obama nor McCain proposes to change that. And as previously mentioned, any capital gains or dividend income from stocks, bonds or mutual funds owned outside of tax-deferred accounts would continue to be taxed at current rates except for couples making over $250,000, or singles making more than $200,000. The claim that Obama would impose a 28 percent tax on the profit from “all home sales” is false. Both Obama and McCain would continue to exempt the first $250,000 of gain from the sale of a primary residence ($500,000 for a married couple filing jointly) which results in zero tax on all but a very few home sales. It’s untrue that Obama is proposing a 28% capital gains tax rate. He said in an interview on CNBC that he favors raising the top rate on capital gains from its present 15% to 20% or more, but no higher than 28 percent. And as for a 28% rate, Obama added, “my guess would be it would be significantly lower than that.” Furthermore, he has said only couples making $250,000 or more (or singles making more than $200,000 according to his policy advisers) would pay the higher capital gains rate. That means the large majority of persons who pay capital gains taxes would see no increase at all. Some of the emails circulating, however, are so consistently mis-representing the facts – easily verified – that one can only conclude a deliberately malicious intent to strike fear in the wallets of middle class voters is behind the lies. In practice, time is short, and rumors often get as much (if not more) coverage as facts on the evening TV news or in newspapers. It’s often hard to tell which part of a media report is the truth. The “news” producers have motives that must be examined: they profit from selling commercials, that’s their income. When in doubt, follow the money. Who profits from the election of McCain or Obama — or your mayor? Who profits from voters feeling disenfranchised and tuning out? Don’t ask what you can do – ACT! The airwaves are as full of misinformation – willfully employed – as the email is. Are you ready to step up and be an Agent of Change, to contribute to help spread the truth?